Wendy Dent has a dream. 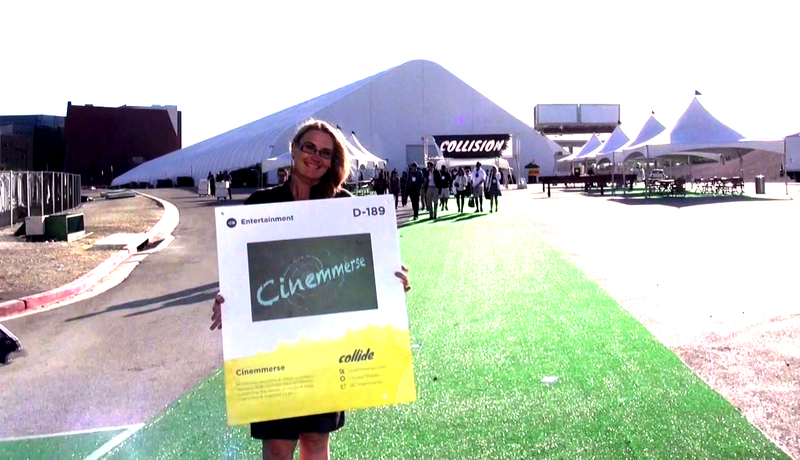 The Australian founder, chief executive and sole employee of Cinemmerse wants to change the way folks think about how they watch everything from advertisements to art films. She’s created Cinemmerse, a website and an app that tracks viewers’ “emotional” response to what they’re watching by monitoring their vital signs through the Apple Watch. Dent’s idea is that writers and directors can take this bio-feedback and tailor their creations to their audience’s responses. It’s also a way for distributors and marketers to get yet another window into the audiences they’re trying to reach. After you log in (accepting the health and location access on the app), you set your “heartbeat at rest” on the watch (one time only). On your iPhone, you can then browse the cine-map for a film, or select a film from the scrolling log of titles. When you select a movie/ad, it will show (in sync) on your watch and when you watch the movie/ad on your iPhone, the watch (in sync) will show your heartbeat response. At the end of the movie/ad, click “vote with my heart” to get results of your BPM response (average BPM, peak BPM during the movie), calorie energy burned and the Cinemmerse star rating, which is also automatically submitted as your vote on the film/ad, directly to the Cinemmerse website. On the Cinemmerse website, you can log in to your account dashboard to access your results log (of heartbeat reaction and calories lost, where you’ve also earned user points for rewards, 1 point per calorie). On the Cinemmerse website, you can watch “Cinemmerse On Demand” films as pay-per-view, browse films available to watch for free or watch films from password-protected pages from links given to you by filmmakers. There’s not a lot of content on the Cinemmerse site, and what is available (from what I could tell) is also available elsewhere for free without you having to pay the fee that the app charges to watch videos. Beyond the limited videos available on the site, Dent says a user also can sync up the watch app with any video they’re watching on another streaming service and use that to gauge how engaged they were with the videos they watched. Beyond leveling the entertainment playing field for women, the app also can serve as a gateway to a new kind of responsive media, says Dent. Emotions could be a new type of rating system that producers, directors and writers can track in real time, she told me. That way, they can begin to create a more responsive type of entertainment that will respond to users’ reactions of the narratives that they’re creating. It’s a broad vision for the entertainment industry and one that would put the audience directly at the center of the creative experience. There are a few problems that could arise from this. The first is the user interface that Dent has built seems a little unwieldy… and the feature — which basically amounts to measuring a heart rate and checking certain indicators of how many calories a person has burned watching a video — seems a bit obvious. Personally, I’m aware of how I’m reacting to a movie because, well, I’m reacting to the movie. I know when something makes me excited or upset and I’m not terribly interested in learning how many calories I’ve burned watching something. Perhaps I’m in the minority. Beyond the app’s usability (will people actually want to sync up their video viewing with an app before they plunk down on a couch with popcorn and a Diet Coke? ), there’s also the broader vision of tying the work of a writer directly to the response of their audience. Do artists want feedback on their work? Probably, but I’m not sure they want their narrative focus grouped to the smallest detail, which is kind of what Dent envisions. Dent says the goal is to expose the work of artists whose creations would otherwise not receive the attention they may rightfully deserve — and I’m all for that. I’m just not sure that Cinemmerse is the platform to make that happen.